A common misconception about working in museums is that you get to touch the stuff, whether artworks or artifacts. 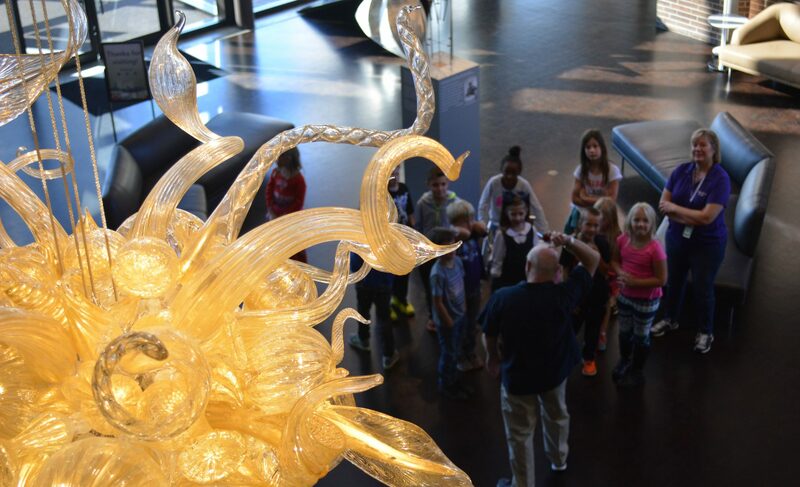 When I lead a tour a common question is: “What is the coolest piece of art you’ve gotten to handle?” As an educator, I have to explain, I’m not allowed to touch the stuff either! While my job requires handling of reproductions, I rarely get to into the vault and see, or write about, the various treasures we have. As a history major in an art museum I often find myself going for my gut reaction to a piece, that split second aesthetic of “I like it” or “I don’t like it” without explanation or the use of a discerning eye. Ginny Ruffner’s lamp-worked glass and mixed media piece was an automatic “I like that.” Quickly followed by, “Wait, what is it?” Despite the large permanent collection of American Cut Glass and the phenomenal glass artists currently on display like Dale Chihuly, Peter Bremers, and Dan Clayman, glass is not something I necessarily gravitate towards. I have the facts down: that glass is made from the same compound as sand; that glassblowing is the oldest industry in the US; that glass didn’t become a fine art until the Studio Glass movement in the 1960’s; that the color comes from different minerals and metals; and that there are various processes for creating glass artwork, depending on what you want to accomplish. At the back of my mind, though, is the knowledge that I see glass every day, from the windows in my office to the cups in my kitchen. Ruffner’s work, however, is definitely not something anyone has in their kitchen. A pioneer in lampwork technique, Ruffner was inspired after seeing a glass painting, The Bride Stripped Bare by her Bachelors, Even (The Large Glass), by Marcel Duchamp. Lampwork, or torchwork, is when thin rods of glass are heated and melted by a stationary torch or lamp. Once melted, the molten glass is formed by blowing and shaping it with tools and hand movements. Previously done with oil-fueled lamps, artists today use either propane or natural gas torches. This process allows for small, detailed working to occur like beads and marbles. Holding both a BFA and an MFA in Drawing and Painting, one of her first jobs post school was creating glass animals as an apprentice lamp worker. She also has a non-profit, SOLA, that honors accomplished but under-recognized mature female artists in Washington, Ruffner’s home state. Today, her pieces are collected by multiple museums, including the Corning Museum of Glass and the Detroit Institute of Art. Ginny Ruffner, American, b. 1952. Urnscape. Lamp-worked glass and mixed media, 1993. Gift of Ian and Mimi Rolland. Looking at the above picture my first question for you is, do you like it? Why? What is the first thing that draws your eye? Lamp-worked glass with miniature landscape paintings on the sides, the piece is all negative space. Is it supposed to be a pitcher? But it has four handles. Is it supposed to be two pitchers reflected? Or an urn, with handles on both sides? But it has four handles. Two urns? A reflection of an urn? Walking around the work doesn’t answer the question. It isn’t until you look at the name of the work, Urnscape, that it makes sense. Delicate details abound, from the dots lining the rims of the “urns” to those on the handles. The colors also stand out, as the blue-green body of the urn is reflected in the sky and ocean of the mini landscapes. Simple in its intricacy, the paintings are what catch my eye. Most everyone is familiar with painted ceramic and porcelain, but to see paintings affixed to the glass was a first for me. Connected by pieces of orange glass, and painted on their own glass medallions, the miniature paintings are precise and detailed. You have to strain your eyes to see the tiny brushstrokes born from steady hands. A seaside vista or a field of crops, the vibrant colors match the mix of red, blue, and orange in the handles, tying the two media together. Whereas some artists would collaborate to create a mixed-media work, Ruffner has all the required skills from her education and previous jobs. Despite her involvement in a car accident that left her with mobility issues, Ruffner remains known for her meticulous design, evident in this work. If you owned this treasure, what would you do with it? As someone that always considers glass a functional, or usable, material for kitchenware or scientific instruments it is fun to ask people how they would display this work. Would you put it in your kitchen? On display in your entryway? In a room with natural light? Or maybe in your office where only you get to enjoy it? The next time you visit us to check out our glass pieces discuss what element catches your eye first and where you would put them in your home!